I hosted Girls Night last night at my home. I decided I wanted to have a theme to the event so I decided to host a Swap Til You Drop gathering. Basically everyone was instructed to bring clothes, accessories, and anything else they no longer wanted. We would then all I freely swap items, each lady selecting items they found appealing to claim as their own. A novel idea I thought and also a fab way to recyle or rather freecycle unused items. The remaining items are to be donated to charity. The evening turned into the most beautiful night of sharing & giving. Not just of the material items we had all brought but of our spirits. The conversations flowed freely from topic to topic. Most of the ladies I invited did not know one another, as I was the common denominator of the group, but it truly touched my heart to see people who were essentially strangers open up and connect so freely with one another. We laughed, we talked, we ate, and we connected. The night flowed into the wee hours of the morning. Eventually we began to wrap up the evening. I could hear phone numbers and email addresses being swapped and I saw hugs being exchanged. Truly a wonderful evening. Our lives get so busy these days with work, family, commitments, and obligations. I think we forget how important it is to take time to stop, play, connect, and fellowship with one another. Today’s Observation: Sisterfriends are a most wonderful resource…Connection is vital to our survival as Humans. It warms the heart and restores the soul. I am most grateful for the beautiful exchange of energy I received last night. 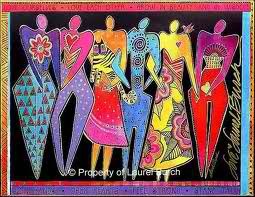 Big Hugs to all of my sisterfriends..Near & Far!!! It was beautiful. Thank you for the positive energy.